The people of Burundi have been voting on whether to accept a new constitution designed to share power and end war between ethnic Hutus and Tutsis. Long lines of voters formed from dawn to take part in Burundi's first ballot since civil war broke out in 1993 between the two communities. Voters used a white card to vote Yes and a black one for No. Correspondents say the constitution is likely to be approved but the real challenge will come after elections. The BBC's Rob Walker in the Burundi capital, Bujumbura, says the new government will need to achieve a delicate ethnic balancing act if it is to avoid a return to violence. Hundreds of thousands have been killed since independence in massacre and counter-massacre committed against both Hutus and Tutsis. United Nations election monitors said they expected turnout to be around 70%. 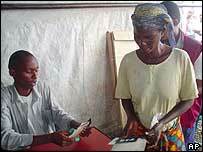 Voting was extended by two hours in many polling stations because logistical problems meant they had opened late. "Burundi is marking a very important step in its history. We are leaving a dark period of conflict and moving towards a new era of democracy," said President Domitien Ndayizeye. Many rural voters know little about the content of the constitution, but they hope it will put an end to ethnic violence in Burundi, our correspondent says. "This vote for me means we need get a constitution and a government of national unity that will work to end this war. And I will be able to rest after six years I have been fighting," said Eric Bigirumuhirwa, a Hutu soldier. It is hoped the new constitution can give all parties a stake in power and pave the way for the election of a new government. Parliamentary elections are due in April and the MPs will in turn elect a new president. This is the first time Burundians have voted since 1993, when they elected Melchior Ndadaye, a Hutu, as president. Shortly afterwards, he was assassinated by Tutsi soldiers and the country descended into civil war. The new constitution is a compromise between an elite from the Tutsi minority, who have held power since independence, and Hutu political parties and rebel groups. Tutsis, who make up 15% of the population, will have 40% of seats in the national assembly, compared to 60% for Hutus. The two ethnic groups will have an equal share of the army and of the senate. The deal has been enough to encourage all but one of the Hutu rebel groups to lay down their arms and Hutu-based parties are urging a yes vote in the referendum, but some pro-Tutsi parties oppose the constitution. They say it does not give Tutsis enough security guarantees. Some Tutsis fear a repeat of the 1994 genocide in neighbouring Rwanda, in which some 800,000 Tutsis and moderate Hutus were slaughtered by Hutu extremists.